You are here: HomenextTopicsnextViews of the city: images & opinionsnextMystery photos of Brighton and HovenextWhere and when? I am looking forward to MyBHers coming up with the answers. The “where” bit is easy. It’s the gardens in front of the Royal Pavilion. Could it be raising money for the building of the destroyer HMS Kipling in the late thirties? The destroyer was named after Rudyard Kipling who had recently died and had a connection with nearby Rottingdean. The mayor could possibly be John Nanson. 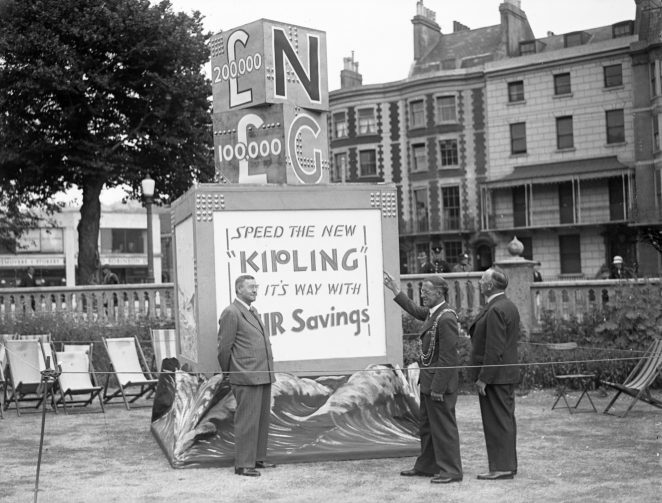 Yes Janet, late 1930’s is correct; the town were saving towards the cost of building HMS Kipling which was constructed in 1937. The buildings to the right of the display are in Pavilion Parade, whilst on the left is the curved frontage of the old building at one time used by the Art College, on the corner of Grand Parade and Edward Street.